If you’re looking for a really tasty recipe for a busy weekday meal, this is it. The sauce is made up of ingredients you can keep in your pantry and can be pulled together in the time it takes to boil water and cook the pasta. What’s really great about this recipe is that even though it’s quick to prepare it tastes special enough to serve to company. The artichokes are not in the traditional recipe and you can omit them if you don’t have them on hand. However, I recommend you do add them as they make the dish really gourmet. (Trader Joes has frozen artichoke hearts that are a really good deal.) If you have time, make the sauce a couple of hours in advance so the flavors have a chance to merge. The longer it sits, the more flavorful it becomes. Sauté garlic in a little water just until soft. Add tomatoes, wine, red pepper, oregano and half of the fresh basil (or all of the dried basil, if that’s what you’re using). Let simmer for about 7 – 10 minutes until it begins to thicken. Add olives, capers and chopped artichokes. Simmer for an additional 5 minutes or more until flavors blend and sauce is reduced somewhat. Adjust seasoning (you probably won’t need any salt since the olives and capers are so salty) and add the rest of the fresh basil. Serve over hot pasta, garnished with Parmesan cheez and pine nuts. Many years ago I entered this black bean chili in a chili cook off in my neighborhood. What’s impressive is not only that I won 2nd place in the contest, but that I was the only vegan chef in a crowd of meat-loving, omnivore judges! I called my chili “No Kill Chili” and I think everyone wanted to try it because of the funny name. Plus they were curious. How could a chili without meat be satisfying? This is an awesome recipe to make for meat-lovers. The dark beer and Boca crumbles make it really hearty. In fact, I used to make two versions of the chili at the same time: one with meat for my kids and one vegan for me. Somewhere along the line I stopped making the meat version and my son never even noticed the difference! Boca crumbles can be found in the freezer section near the Boca burgers. They taste eerily like ground beef (from what I can remember…) so if meat substitutes aren’t your thing, try the version with bulgur wheat instead. The bulgur has a nice chewiness that stands in well for ground meat. Plus it’s a whole food and really is healthier for you than the meat substitutes. TVP (texturized vegetable protein) looks like Grape Nuts and can be found in the bulk food section. The instructions for rehydrating it before you add it to the chili are included in a footnote below. I like to serve this chili over a chunk of Happy Herbivore’s fat-free corn bread and top it with chopped sweet onions, crushed tortilla chips, and some diced avocado. My kids like it best spooned over a baked potato with some vegan cheese. It freezes well so feel free to double the recipe and freeze half for an easy winter’s night dinner. *To prepare bulgur or TVP, put ¾ c bulgur or TVP in a heat proof bowl. Pour 3/4 c boiling water over it. Let sit for about 10 minutes. Add to crock pot with other ingredients. Sauté onion in a skillet in a couple of tablespoons of water until browned, about 10 -15 minutes. Add garlic and sauté just until soft and fragrant. Don’t let it burn. Add Boca crumbles and additional water to keep them from sticking to pan. Sauté until heated through. Add mixture to crock pot along with all other ingredients. Stir. Cook on low 6 – 8 hours. Alternatively, you can simmer on the stove top for about an hour until flavors are merged. Add additional water if too thick. Adjust seasonings. 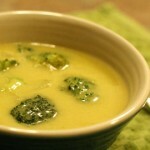 This is my adaptation of a cheez soup recipe from The Ultimate Uncheese Cookbook. 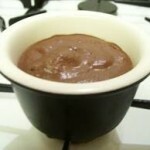 It’s so creamy and rich you’ll never believe it has no butter, margarine, oil or cream in it! 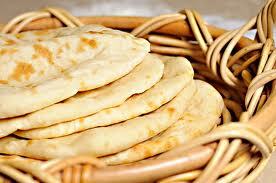 I make it often in the winter and serve with bread for dunking or a scoop of rice on top. Here’s the “plus”: you can also make this soup into a sauce by thickening it with a slurry made with 1 – 2 tablespoons of cornstarch mixed equal parts cold water. Add as much slurry as you need to get a nice thick sauce-like consistency. The sauce makes a terrific topping over a baked potato. Or you can pour it over macaroni for a super easy, yummy mac and cheez. I also like to use the sauce to make a broccoli-cheez casserole: mix sauce with equal parts cooked brown rice in a mixing bowl. Add sautéed mushrooms if you have some on hand. Pour mixture into an oiled casserole, top with breadcrumbs and vegan parmesan cheese, cover and bake at 350 for 20 minutes. Uncover and bake an additional 10 minutes or until bread crumbs are browned and the casserole is bubbly. Peel the broccoli stem and chop. Reserve the florets. 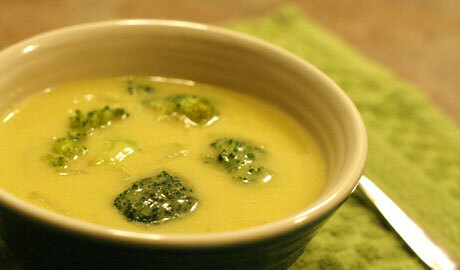 Combine broccoli stems with potato, onion, carrot, garlic and broth in a sauce pan. Bring to a boil, cover and simmer about 20 minutes, until very soft. Meanwhile, chop the florets into small, bite-size piece and steam until soft but not mushy. Blend the cooked mixture with the rest of the ingredients — except the milk and reserved florets — until very smooth. (You may have to do this in two batches.) Add some milk if it’s too thick to move well in the blender. Pour blended mixture back in to sauce pan and add milk. Heat to simmering and cook until thickened. Add reserved steamed florets. Adjust seasonings. Add more milk if too thick. Garnish with vegan parmesan cheez if desired. Vegans don’t get a lot of dinner party invitations. (If we do, the host usually asks us to bring our own food since most people don’t know how to feed a vegan.) But last Friday some omnivore friends invited us to dine with them and another couple. The cool thing was that they wanted to serve an all vegan dinner! The caveat? WE had to show them how to cook it. They would do the shopping and we would teach them how to cook up a yummy vegan feast. So since we LOVE turning omnivores on to the joys of plant-based eating, we naturally agreed.I wanted to show them a recipe that’s fancy enough for company but simple to prepare. 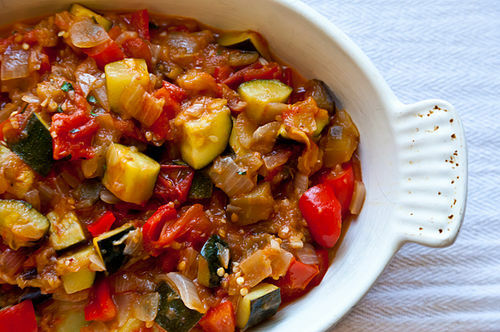 I decided to share with them my recipe for ratatouille, which has been a basic go-to recipe of mine for as long as I’ve been a vegetarian, about 25 years. What I love about it is that not only is it colorful, yummy, and easy, it’s also super versatile. I’ve served it on pasta (fettuccine or penne are nice) or on a bed of grains, like polenta or quinoa. I even like it as a crostini topping for an appetizer or spread on French bread halves (with or without some melted vegan cheese) as a sort of French bread pizza. This iteration is oil-free, since we are trying to eat mostly whole foods these days. The pine nuts and vegan parmesan cheese provide enough richness to round out the meal. Since four of the dinner guests eat gluten-free, I went the polenta route. 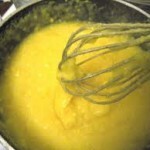 I’m including directions for making polenta from scratch, since it’s super easy. But you could also buy the pre-made polenta in tubes if you don’t have time. (That’s what our hostess did.) Just put it in a pot with a little water and smash it with a potato masher. Use a whisk to stir and heat and add additional water until you get a nice mashed potato-like consistency. Give it a try for Meatless Monday or make it the next time you have vegans over for dinner. They’ll be thrilled that they don’t have to bring their own food! Directions: Heat a non-stick skillet over medium high heat and add red onions. (You really, really DON’T need oil to sauté onions! I swear! Try it and see…) Cook until translucent. Add garlic and sauté about 1 minute until fragrant. Don’t let it burn. Add peppers and cook until they soften, about 3 minutes. 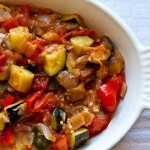 Add eggplant and cook, stirring frequently, until it begins to soften and brown, about 5 minutes. Add zucchini and cook for 3 minutes. Add tomatoes, water, tomato paste, salt, pepper and half of the fresh herbs. Stir well. Turn heat down to simmer, cover and let cook 15 minutes. Remove cover, stir well and cook an additional 10 minutes until the sauce cooks down and flavors merge. If it is too thick, add additional water. Add reserved herbs and stir to incorporate. Taste for salt and adjust seasonings. Serve over polenta or pasta. Garnish with vegan parmesan cheese, pine nuts and additional fresh herbs. Directions: Put all ingredients in a food processer and process until combined. Put in a shaker container and store in the fridge. Directions: Bring water to a boil. Add salt. 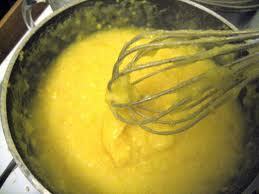 Slowly pour the polenta into hot water, constantly stirring with a whisk to avoid lumps. Bring back to a boil and then turn heat down to a simmer. Cook about 20 – 30 minutes, stirring frequently with a wooden spoon, until polenta is thick and soft and has the consistency of mashed potatoes. Add more water if needed. Taste for salt and adjust seasonings. Note: When polenta cools it congeals, so to reheat leftovers put polenta in a bowl with a little water and smash it with a fork to break it up. 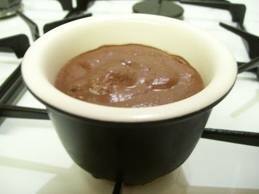 Microwave or heat on the stove and stir/smash at frequent intervals while heating until it becomes soft again. Bring broth and lentils to boil in a pot over high heat. Reduce heat to medium low, partially cover and simmer 10 -20 minutes or until tender. Remove from heat. In skillet saute onions and garlic in a little oil five minutes. Add red pepper flakes and curry, cook 2 minutes more. Add tomato paste, then coconut milk and lentils. Cook 3 minutes. Season with salt and pepper and lime juice if using. 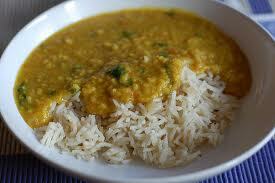 Garnish and serve over rice with naan. Melt chips in microwave. Blend with the rest of ingredients in a blender until smooth. Pour into 4 serving containers and chill at least one hour. Can also be poured into a graham cracker pie shell for a pie.